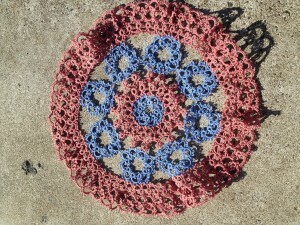 Just finished going back and redoing those last three rows on the doily. It is definitely working better, though I’m not sure it’s at 100% yet. There’s still some ruffling going on. 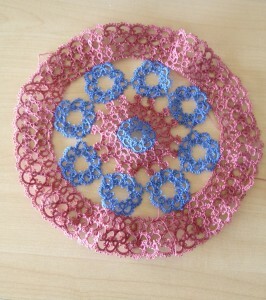 I’ve put the doily under a stack of textbooks and am hoping that will be enough blocking to make it lay flat. 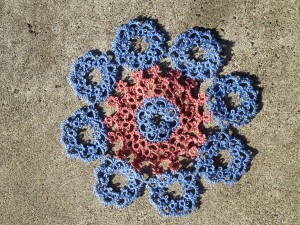 It’s been pretty crinkled up in my tatting bag for the last week so that probably wasn’t very good for it. If that works, I’ll continue on with the last row. Though to be honest, I really think the pattern looks fairly complete now. 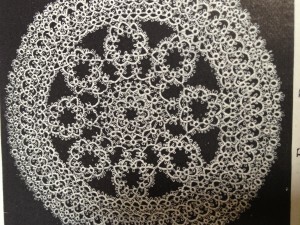 The last row is just a double row of rings-only done with a single shuttle and I think it has a bit of a different look than the rest of the doily. The solidity of the rows I just finished make for a nice finish, I think. On the right is the picture from the book of the finished piece. It will be interesting to see how mine turns out! This was just a test run with some size 10 DMC that I had laying around. The next step to redoing this pattern from the Priscilla books is to do it once more in Lizbeth (probably size 20) and write out the pattern as I do so. Then on to playing with my new diagraming program and seeing if I can get it looking nice. Craftsy has a new set up that lets you link to your own pattern store and show pictures of your own patterns on the sidebar. 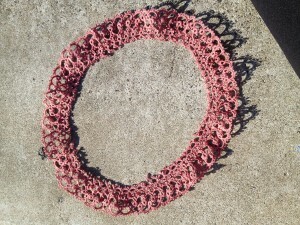 It’s sort of exciting to see my own patterns on both the Craftsy and the Etsy widgets on the sidebar here. Makes me feel like I have the startings of a real business! Things have been extremely busy here. I had three large orders for gloves come in last month as well as a couple other smaller ones. I’ve finally got them all pretty much out the door now. Down to just one small one left that I’ll finish up this weekend. It will be nice to take a few moments and recover. I had a set of beginner classes at Pacific Fabrics in Northgate the last two weeks. My students did very well and seem to be excited to do more. I’m hoping to get my schedule sorted out well enough get some new classes on the calendar. I also have another beginner class at Bird Tail Beads in Bellevue tomorrow so there are lots of new tatters getting started. I’m super super excited to be involved with getting people interested and started with tatting! In other news about learning, I went out to Camp Wannatat in Montana a couple weeks ago and had a wonderful time (as always) and learned a lot. I finally got to meet the Shuttle Brothers which was great (they signed my copies of their books) and Reit was there again from Europe. It was great to see her again as well as everyone else. It was the 50th Camp Wannatat and the last one to be held at Bobbie’s house so it was a great celebration and I was very honored to be included in it. Next year they will start to be at an actual camp in Montana. It’s going to be quite the change, but I’m glad that it will continue and that more people will be able to attend at the bigger venue. That’s the super quick update. Things have been busy with the rest of life as well lately, but I’m hoping that things will settle down here in October and I’ll get to work on some of my bigger projects and not just feel like I’m pushing to keep up.